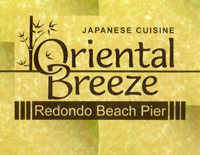 Oriental Breeze Redondo Beach is a Japanese restaurant located on the Redondo Beach Pier. The restaurant is open daily from 6pm-11pm and offers a wide variety of sushi, rolls, soups, salads and grilled dishes. Extra Sauce, Smelt Eggs, Avocado $0.50up / Soy Paper, Cream Cheese $0.75up / Hand Roll $0.50 Less. Toppings: Strawberry, Blueberry, Banana, Chocolate, Ice Cream, Cream Cheese.